Medicare Questions, everyone new to Medicare has them. Entering Medicare can often lead to confusion and information overload. Everyone that has been on Medicare has the answer, but the problem with that is, it is normally only a partial answer at best and more of an opinion. We believe that you must first understand Medicare and the process before you can make an informed choice about a Medicare Supplement. You can always call us at 844-528-8688 for answers, but for your convenience we have built this page to answer the Medicare questions we get most often. We also have the FREE Medicare Academy video course, you can enroll HERE. Medicare consists of 4 parts, but only two of them come directly from Medicare. The other two are offered by private insurance companies and are monitored and administered by Medicare. Medicare Part A: Medicare Part A is your hospitalization, it covers you anywhere that accepts Medicare. Without a Medicare Supplement Plan, Part A has a deductible and covers 80% of Medicare approved expenses. There is no premium for Medicare Part A if you worked 40 quarters and paid Medicare taxes. 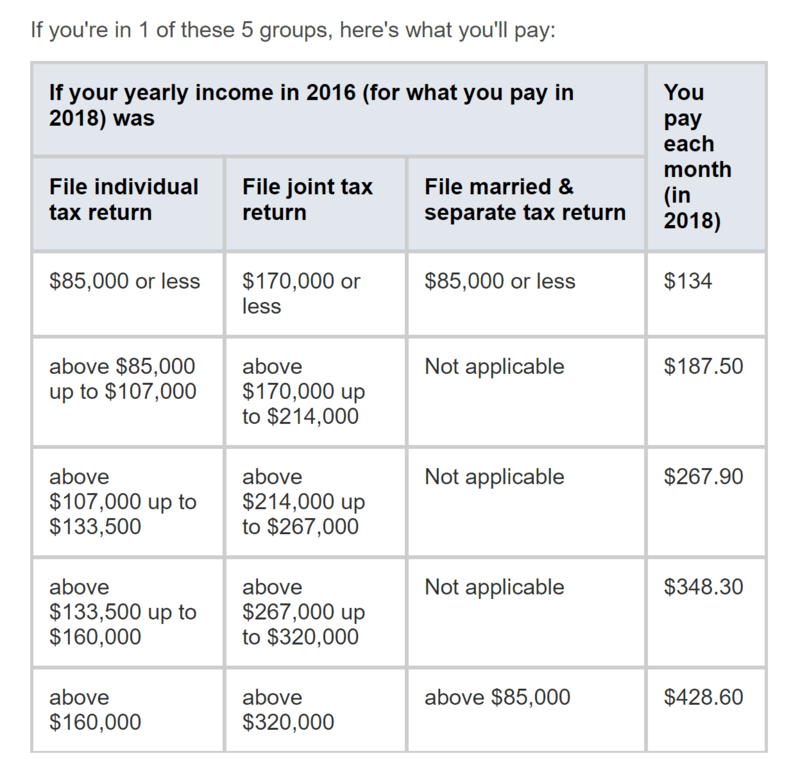 If you did not pay Medicare tax, the premium you pay will be calculated by how many quarters you did pay in, up to a premium of $422.00 per month. Medicare Part B: Part B covers you doctor, durable goods and some prescriptions (that are administered as an outpatient). Part B is accepted by anywhere in the United States that accepts Medicare.Medicare Part B has a deductible and a premium that is set by your income two years prior, most will pay $134.00 per month. See the chart below for premium rates. Medigap is just another term for a Medicare Supplement Plan or Supplemental Insurance Plan. It is one of 10 Medicare supplement Plans A-N in all but 3 states (Wisconsin, Minnesota, and Massachusetts. For a complete explanation of a Medigap or Medicare Supplement Plan see our full article HERE. The Medicare Supplement Plan G is, at this time, the most comprehensive Medicare Supplement Plan on the Market. This plan is very similiar to the Medigap plan F other than with plan G, you will pay the Medicare Part B deductible out-of-pocket. After you pay the once a year deductible the benefits are identical to the Plan F and at a much lower premium cost. See our full article on the Medicare Supplement plan G HERE. Plan N is fast becoming a favorite among Medicare participants, especially with people who live in states that do not allow Part B excess charges. It is low cost and is close to the benefits of the Plan G, but it does have some costs that the Plan G does not expose you to. With a Medicare Supplement Plan N you will have a copay for the doctor of $20.00, and a copay of $50.00 for the emergency room. Plan N also does not cover the Part B Excess charges that could be added to your bill if your doctor is not assigned by Medicare and you live in a state that allows the charges. See our complete article on Medicare supplement Plan N HERE. The Medicare Supplement Plan F, was the most popular Medigap plan by both agents and Medicare recipients. If you have a friend or family member on Medicare that says "I never see a bill" they have a plan F. While that sounds like a great deal, it really is not, the plan F has the highest premiums of all of the plans but it covers everything resulting in what is called "first dollar coverage". Simply put you are able to change a Medicare Supplement Plan anytime you want, there is no special period. While you are allowed to apply to change your Medicare Supplement Plan, you can be denied. In most states you will need to go through the underwriting process and answer health questions. The health requirements do vary company to company so it is best to contact us to help guide you through the process, we know what carriers are diabetic friendly or only look back two years at cancer. Never a fee for our services. For more information on states with special open enrollment periods see our in-depth article Here. A Medicare Advantage Plan is NOT a Medicare Supplement, people confuse them all the time, but they are very very different. A Medicare Advantage Plan is a private insurance company that is contracted with Medicare providing your Medicare benefits. Medicare Advantage Plans normally have copay's for almost every service and with most you will have to stay in the providers network. Please see a full explanation of what a Medicare Advantage Plan is HERE. Medicare does not cover dental or vision, unless it is due to illness or injury and deemed medically necessary. Some vision tests are covered, like Glaucoma or macular degeneration.